Will Heathrow Southern Railway Make Heathrow’s Cargo More Efficient? This page on the Heathrow web site talks about the future for cargo at the Airport. It starts with this paragraph. Heathrow is the largest UK port by value and our ambition is to become one of Europe’s best airports for cargo. We have listened to our customers and developed a cargo strategy that will take us there. The airport sums up its plan for cargo with these bullet points. Nothing is said about being more energy efficient and emitting less carbon dioxide. This document on Heathrow’s web site is entitled Heathrow’s Blueprint For Reducing Emissions. They list ten things they are doing. Bring in the newest and cleanest aircraft. Continue to drive down emissions from aircraft at the gate. Charge forward with electric cars and buses. Plug in more electric airside vehicles. Provide a pool of low emission vehicles. Efficient driver training and education. Host an air quality conference. This list was from a couple of years ago and there is a certain amount of PR, but there is some thinking in the right way. To return to cargo, which is on Heathrow’s list of ten things they are improving, the following can be said. Heathrow handles a lot of cargo by value. Most air cargo from Heathrow goes in the holds of passenger aircraft. Very little if any comes into the airport by rail. 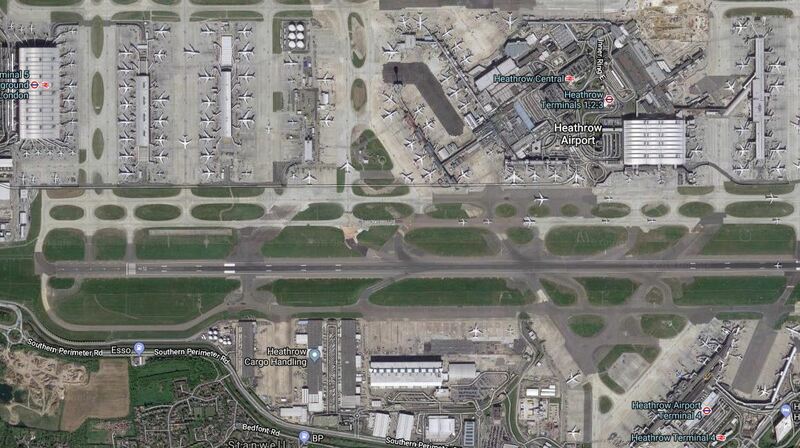 This Google Map shows the central part of Heathrow Airport. Note Heathrow Cargo Handling towards the South West corner of the Airport. This map from carto.metro.free.fr shows the rail lines under Heathrow. I actually think, that some lines go under the cargo area. There must be scope for consolidating cargo outside the airport and bringing in the containers in special trains. There would be plenty of capacity on the link into Terminal 5 station. Replacing trucks with electric trains would reduce the airport’s carbon footprint. I am led to the conclusion, that there may be possibilities to bring cargo into and out of Heathrow Airport by train, using the link created by the Heathrow Southern Railway.